When you're 5 and live in Miami with a canal for your backyard - you learn how to fish. A kernal of corn - a bit of bread squished around the hook - and you were almost guaranteed a fight from Mr. Sunfish. And on those weekends when dad brought home shiners from the bait shop - all hell would break loose. Huge freakin' bass came out of the water after the things. The 8 year old kid in the apartment two doors down had some kind of state record from our canal and it was only 50 feet from my room........ those were the days. Until of course a few years later when you end up running around on trails next to streams in the Sierra Nevada - then those were the days. But then, for too many years - you forget the joy of whatever it was you loved as a kid and get sucked into the work-a-day world. Some people actually get off on it - their career defines them - too funny. 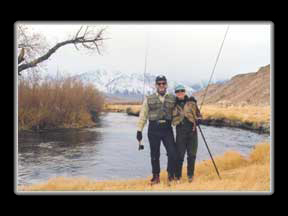 From the Sierras - to the Bahamas, Mexico and our home on the Descutes river - we're all about the fishing. Hope you have something in your life to keep the joy around! Talk about joy - take a look at our Christmas trip video to Rancho Leonero in Baja!